Engagement, Creativity and Inspiration Found in New Afterschool STEM Programs. One program mentioned here that you definitely should check out is the NASA Summer of Innovation program. This is part of the 21st Century Community Learning Centers (21st CCLC) program, where middle school students throughout the country have the opportunity to solve exciting and meaningful engineering design challenges. According to the article, there are now 80 sites across the United States that are participating in the program! 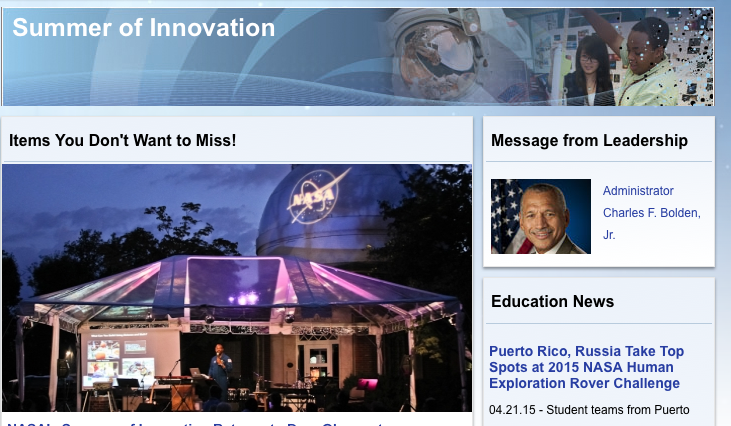 Go to the NASA page here to look for a program or person near you! My thanks to Ellen Lettvin for sharing this information on the web! Ellen is a Robert Noyce Senior Fellow in Informal STEM Learning in the Office of Innovation and Improvement. Thanks for reading this post! And more thanks for taking another step forward to join the exciting world of aerospace and rocket science! P.S. Are you harnessing the power of Google Alerts to learn about people, news, discussions, and events that are exactly what you need and want to know about? If not, check out this blog article on my Engineer Your Innovation website to learn why and how to get it set up for yourself. ← Let the social media sharing begin!